Last month, we had a few unexpected snow days, yes in March, so I took advantage of the schedule-free days, and decided to clean up my laundry closet. (Before the knee surgery!) Now, let me begin by saying that my washer bit the dust and the dryer was close behind, so we bought a new set of stackables. I didn't really want these, but given the lack of space we have in there, it was no contest. Now that I have a whole extra 3 square feet of space (sad, right?) I decided to make the most of the tight quarters and added a cabinet, counter, shelf, and hooks. Yeah, I need to paint in there, but I am not exaggerating when I tell you, that aside from the cat, I am the only living soul who goes in there. It's upstairs and out of sight. (Plus I'm the only one who does the laundry). 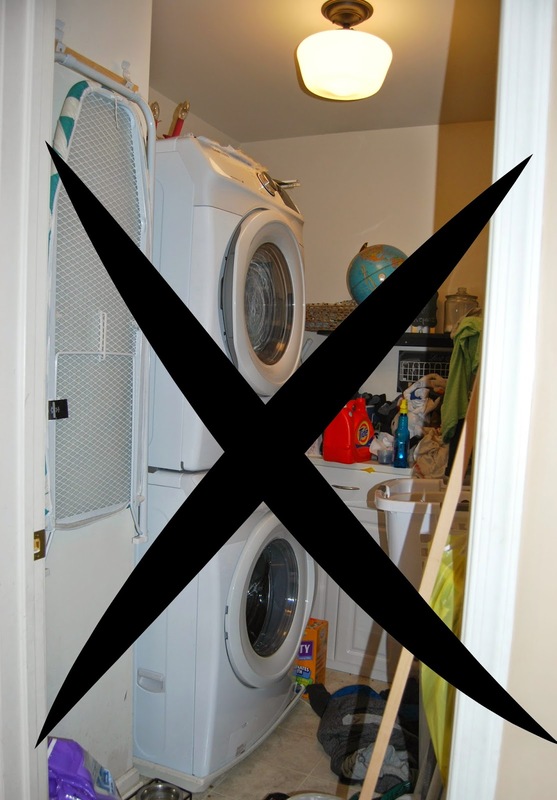 I also decided to remove the door because it opened in, and it really gets in the way when you are heading out of there with a basket full of clothes. However...this is what it looks like most of the time! okay all of the time. We needed the door back. And this one... I have no words, really, I'm wiping up drool. 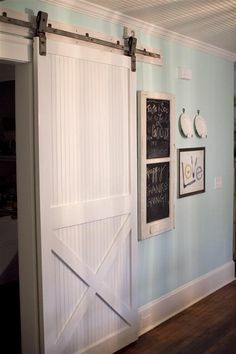 I do like the barn door style, simple to create, but maybe overused? They really aren't unique anymore. 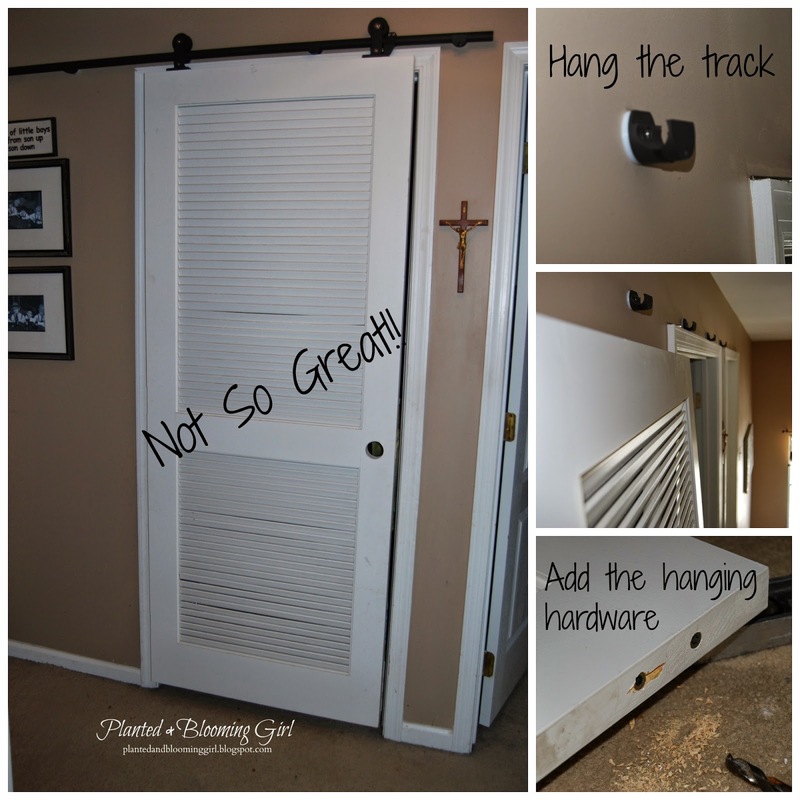 I decided to install an industrial door track which was a purchase I made (for no reason) last summer. So I busted that out, and after 2 hours of interpreting the wordless drawings, I had it assembled. The spouse thought the concept of a sliding door was great. I was blushing on the inside at my creative genius, when he threw in the comment, "...it's a shame that ugly track thing shows..."
Anyway, back to the door. 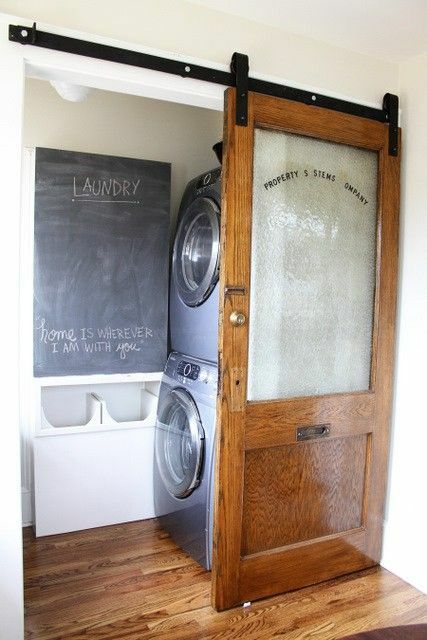 It's a standard louvered door (yuck) and again, nobody sees it but it's ugly and needs love, lots of love. I can't wait till this knee is project-ready and I'll share what I come up with.